As a full time mom of three little ones, but one with a strong innate need to create every day in order to maintain sanity, I feel like I do a fairly good job of creating opportunities for creativity and stitching, sprinkled throughout even the busiest of days. First, it was knitting–something I could carry with me and leave next to the couch to pick up while nursing or holding a sleeping baby in my lap. But as my children grew, their desire to turn yarn into spider webs, spy laser obstacles, leashes for stuffed pets, etc. also grew and knitting became quilt a risky endeavor. English paper piecing helped and I dove into basting hexies and honeycombs. Then I felt like I needed something new. 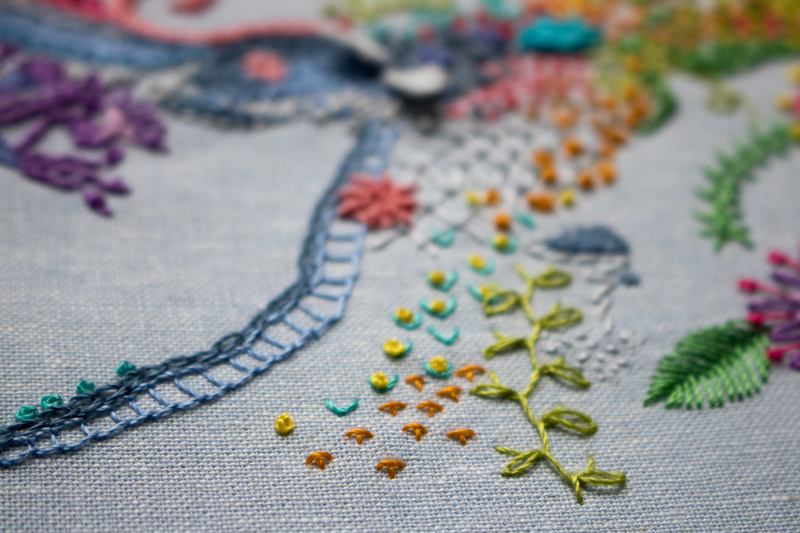 Enter: embroidery. It’s small, I can store it up on the counter out of reach, it’s clearly mommy’s–not simply a ball of yarn begging to be unravelled or little fabric bits to be tossed around–, and it’s something I can pick up and put down quickly. Late last year, I kind of got hooked on the quick mental fix that comes with freestyle embroidery while I was creating this Alison Glass hoop. In late December, when some friends brought my attention to the 1 year of stitches project initiated by Hannah Claire Somerville, I was intrigued. After a bit of googling, I found this invitation by Sara Barnes of Brown Paper Bag, who helped spread Hannah’s open invitation for others to join, and I knew that I had to join in. Hannah’s specific personal rules and stipulations are here, but I chose to take a looser approach. The goal is to stitch at least 1 stitch every single day for a full year, 365 days. I went into the year with a 10″ hoop of Robert Kaufman Essex linen in light blue, my stash of Aurifil 12wt threads, and no plan at all. Here is my hoop after 1 month of daily stitch-whereever-the-wind-blows stitching. Fun, right!? I created a separate account on Instagram @NQ1yearofstitches to document my daily stitches, and I am trying my hardest not to make any kind of formal plan at all. 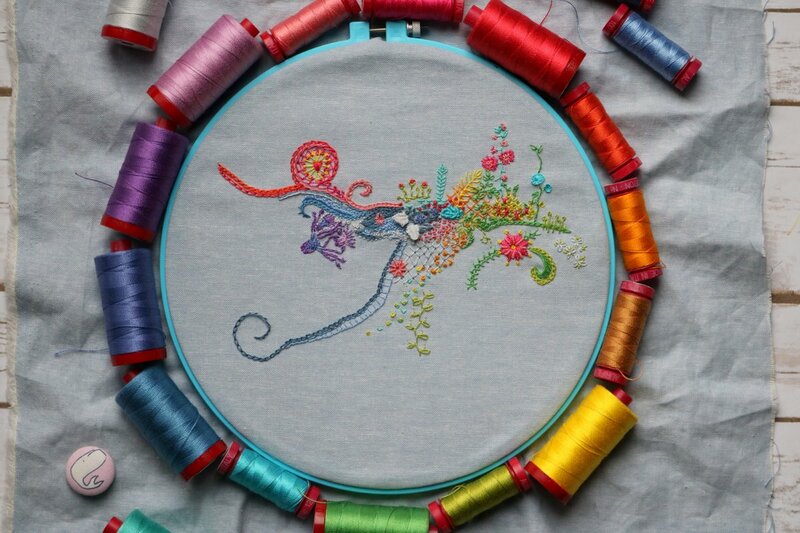 My basic strategy began as a daily google of “embroidery stitches” as an image search. I would scroll through, find a stitch that looked cool, and then find a tutorial on how to make the stitch. 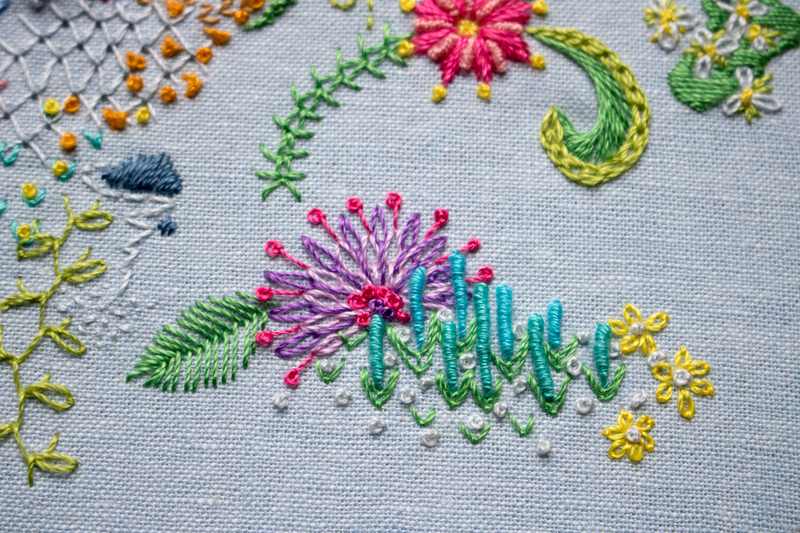 I began by learning bullion knots, so this whole project began with that little mass of turquoise squiggles and has grown organically from there. 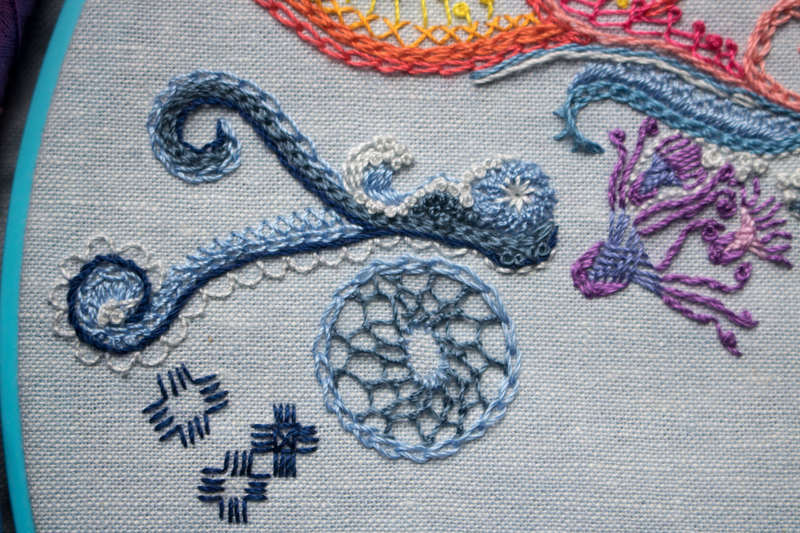 I love the texture that results when you stack embroidery stitches together. Those white floppy things are my first attempts at braided picot stitch, another fun one! This has been really fun so far, and as of the writing of this post, I’m already over halfway through February, too! (You’ll have to wait until March, or check the IG account, to see those additions, though!) I’ll plan to share an update each month, so that you can see how this grows. My personal guidelines include stitching at least one stitch each day, trying to plan as little as possible and simply stitch whatever feels right each day, and not remove any stitches no matter how much I dislike the final outcome (cough, cough, that octopus family, cough). I figure this way, the stress of getting everything *just* right disappears, and instead the thought that it will all work out somehow in the end dominates. No stress! This is a really fun, exhilarating project since it is pure spur of the moment random creativity. 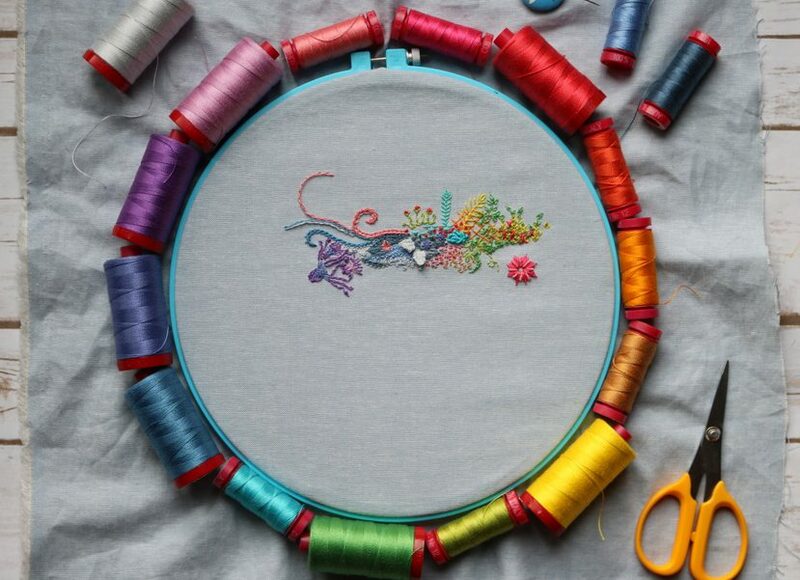 If you have any cool, unusual embroidery stitches to recommend, I’d love to add some more to my arsenal. There’s something about learning something new that makes my day. 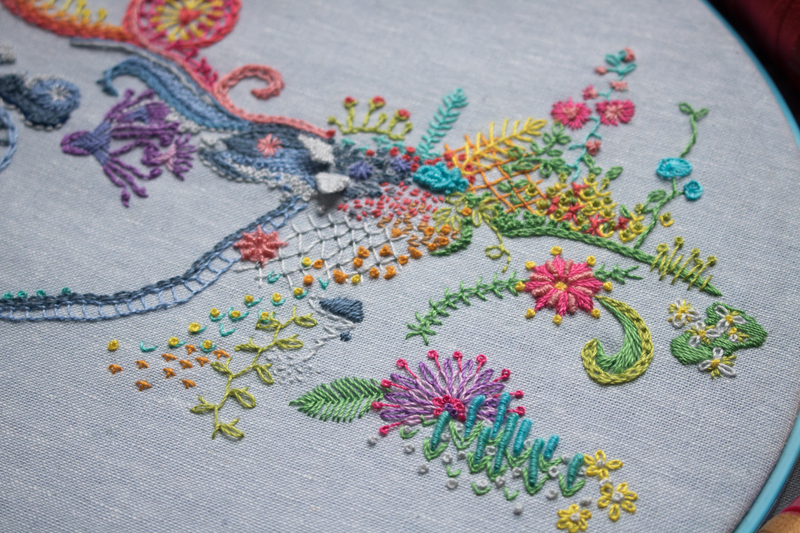 If you are itching to learn embroidery, this is also a really fun way to do it. 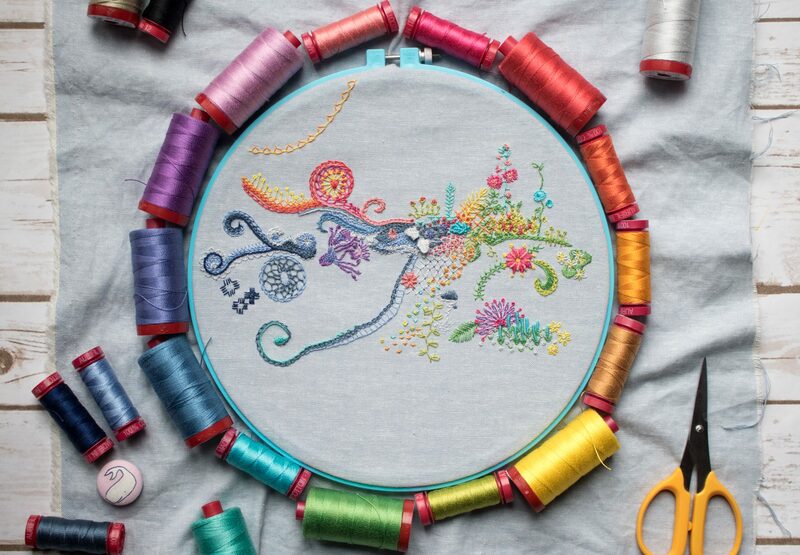 In the end, you end up with a hoop of many different stitches, as well as a visual story of your progress! Happy stitching! I’m linking up with Beth at Cooking Up Quilts for MCM, since I’m excited to be blogging, and always excited to stitch!